FREE – The Electric Company Party Game: Lost on Prankster Planet for the iPad. Marcus and Jessica are stuck on Prankster Planet. Kids help them to escape by completing physical challenges, silly brainstorms, and math questions. 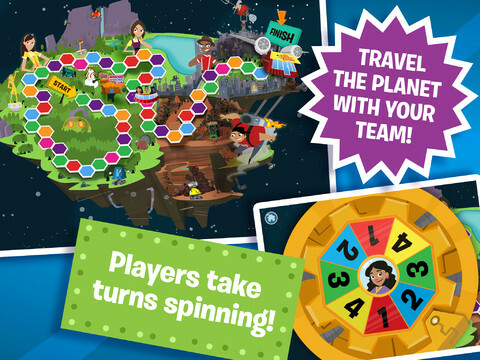 Based on the PBS KIDS series, The Electric Company, this digital board game puts kids in teams to add, draw, discuss, think, act, problem solve, and dance their way back to Earth. Some of the academic areas covered include: geometry, addition/subtraction, data analysis/graphing, telling time, and coin recognition/value. Love the idea of a virtual board game – all of the fun without any lost pieces, broken boxes, etc.